David Smith, the Guardian's bureau chief in Washington, D.C., witnessed Wednesday's exchange between CNN's Jim Acosta and U.S. President Donald Trump. The White House's decision to suspend CNN correspondent Jim Acosta's press pass "should be condemned in the strongest terms," according to another journalist. David Smith, White House correspondent for The Guardian, witnessed the tense exchange between U.S. President Donald Trump and Acosta on Wednesday. Acosta was holding a microphone, trying to ask a follow-up question, while the Trump was calling on a different reporter. As an aide tried to take the microphone away, Acosta resisted, briefly touching her on the arm as she did. "We will never tolerate a reporter placing his hands on a young woman just trying to do her job as a White House intern," press secretary Sarah Huckabee Sanders said in a series of tweets afterwards. "The White House is suspending the hard pass of the reporter involved until further notice." Acosta responded to the Twitter thread with a single sentence: "This is a lie." Smith spoke to As It Happens host Carol Off more about what happened at the White House press conference. When the White House accused one of your peers of "placing his hands" on a White House intern, how did you react? I was shocked and horrified, but sadly not surprised knowing Donald Trump and this White House's attitude to the press. Trump has obviously called us the "enemy of the people" pretty much since he took office and has certainly had a combative approach with many journalists, especially CNN and in particular Jim Acosta. Have you seen the video of that encounter? Yes and it seems pretty innocuous to me, I think. You see the intern go for the mic. You see Jim Acosta standing his ground and wanting to hold onto it. It's the kind of thing I'm sure I have done before — that many reporters have done before — and would do in that situation. And I think a very ludicrous attempt now by the White House to spin it … and sort of turn it into some kind of big incident when really, at the moment, in the room, I don't think anyone felt that way. Reporters who were there, including those closer than I was, didn't feel that way. Even Trump himself didn't react —​ didn't say anything. Indeed the reaction of the intern herself, I didn't see any kind of dismay or feeling of mistreatment. She just sort of accepted that Acosta was holding on. I think it's a rather shameful attempt by the White House to demonize a reporter they don't like. It does though seem that there are two versions of the video, right? There is the one that you're referring to that describes exactly what you're saying. There's no laying on of hands there. 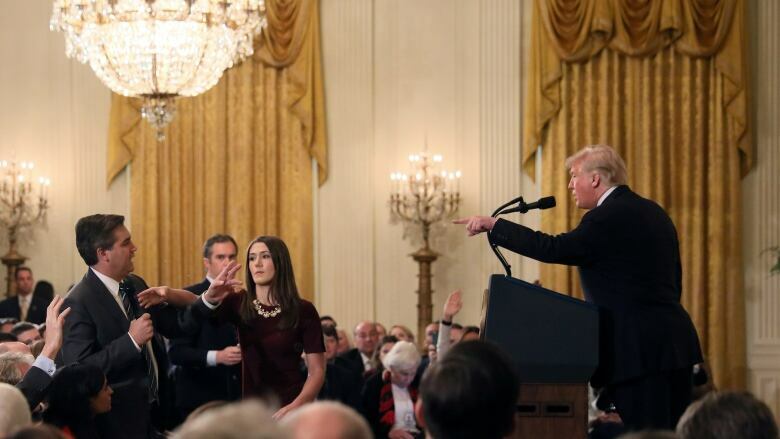 But there is another one that the White House is distributing that indicates a more aggressive act on the part of Jim Acosta ... that he's actually doing some kind of a gesture on her arm. People are saying it's altered. What do you know about that? I don't know much more than anybody else who watches them or reads about them. Certainly, from my vantage point in the room I couldn't see any of that. I've watched both versions of the videos a few times. I can't really see that many differences. To me, they're both pretty innocuous. It's certainly interesting that many of Acosta's defenders are claiming the video is manipulated. I think the person behind the video denies that and says it's more a case of zooming in rather than changing the speed. Again, defenders of Acosta are saying the person who first made this video has ties to websites that traffic in a lot of conspiracies, and it's problematic that the White House would promote that. The very fact that there would be two versions of this is suspicious, right? Absolutely. And I will go with the version on C-SPAN. Jim Acosta [has lost] his very important press accreditation. What do you make of that? Is that something that happens frequently among the White House correspondents? No. Indeed I'm not aware of it ever happening, having covered this beat for three years now. Again, it should be condemned in the strongest terms. It's a genuine attack on freedom of the press. It should be said we're very privileged as reporters in the U.S. to have access to the White House. There are many countries that do not allow reporters into the presidential residence in that way. It's just very petty and disturbing for the White House to take this action now over what appears to be a personal vendetta over one man. It shows that we've gone from the mere rhetoric of "enemy of the people" and "fake news" —which was bad enough — to actually now barring people. This transcript has been edited for length and clarity. With files from Canadian Press.